The MLB Postseason got underway last night with the National League Wild Card Game. Tonight it’s the American League’s turn. It’s the A’s at the Yankees, and a ton of former Sounds are involved. As I wrote yesterday, each of the 10 clubs in the postseason has at least one former Sound on the roster either as a player, manager or coach, and as many 50 former Sounds could be involved depending on roster decisions as the playoffs unfold. Below is a breakdown for the Athletics and Yankees. I’ll have more on the Division Series teams tomorrow, and you can see yesterday’s post about the former Sounds that were involved in the Rockies-Cubs game HERE. Fun fact: The Yankees’ 100 wins marks just the second time a Wild Card team won 100-plus games, as the ’01 A’s won 102. Yankees pitching coach Larry Rothschild (’78) was part of the Sounds’ inaugural season, as he made five relief appearances that year as a Reds minor leaguer. He made just seven appearances in the major leagues as a player (Tigers ’81-’82) but has had a very long career in the big leagues as a coach and manager. One of the pitchers Rothschild oversees is Sonny Gray (’17), the Smyrna native and Vanderbilt alum who made a rehab appearance with the Sounds last year. Gray went 11-9 with a 4.90 ERA in 30 games (23 starts) this year for the Bronx Bombers, though he is not on their roster for the Wild Card Game. Fun fact: The A’s are in the playoffs for the first time since they made it three years in a row from ’12-’14, and their 97 wins are their highest total since they won 103 in ’02. Given that the Sounds spent the past four seasons as an A’s affiliate before recently announcing a new parent club, and the A’s then affiliating in Las Vegas, there aren’t many members of the A’s who are NOT former Sounds. Of the 25 players on the A’s roster for tonight, 19 are former Sounds in one way or another, and 12 of them played for the Sounds this past season! The A’s amazing season has been piloted by manager Bob Melvin (’85), who has managed the club since ’11. He batted .271 with nine homers and appeared in 53 games for the Sounds in ’85 when they were a Tigers affiliate and was called up to Detroit in late May that year for his major league debut. His bench coach, as many Sounds fans know, is Ryan Christenson (’17), who managed the Sounds last year before joining Melvin’s staff this year. Keep in mind that teams use a very different strategy in making roster decisions for the single Wild Card Game than for the best-of-five Division series, so it’ll change if the A’s defeat the Yankees and advance. The A’s have joined the trend of teams electing to use a reliever, or “opener,” to start a game, and tonight they’ll give that job to Liam Hendriks (’16, ’18), who rehabbed with the Sounds two years ago and then made 23 appearances with the Sounds this past season after being designated for assignment. He had a 2.84 ERA for the Sounds, earned his way back to Oakland in September and had much better results down the stretch. The A’s have two former Sounds who played in Nashville as Brewers prospects and now are key veterans in Oakland: outfielder/DH Khris Davis (’12-’13), who had another monster year with an 48 homers (1st in MLB) and 123 RBIs (2nd in AL), and catcher Jonathan Lucroy (’10, ’12), a crucial presence for a mostly young pitching staff. The young core of the A’s and their bright future is built around several recent Sounds, including first baseman Matt Olson (’16-’17), who played in all 162 games this year, third baseman and soon-to-be perennial Gold Glove winner Matt Chapman (’16-’17), utility man Chad Pinder (’16-’17) and outfielder and human highlight reel Ramon Laureano (’18). 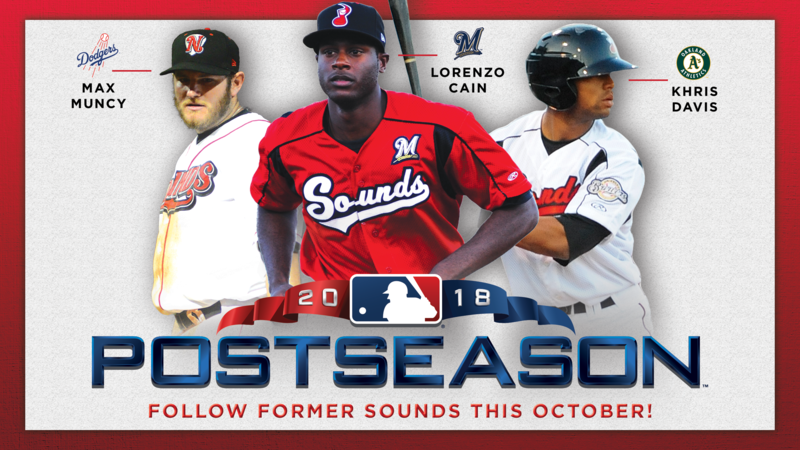 The Sounds’ team MVP from this year, Nick Martini (’18), has become a fixture in the Oakland outfield and the top of the order, and second baseman and Sounds fan favorite Franklin Barreto (’16-’18) is on the A’s roster for the Wild Card Game over Dustin Fowler (’18) as a speed option off the bench. The only regular starting pitcher the A’s have on their roster for this “bullpen game” is Edwin Jackson (’18), and the rest of the pitching staff includes several guys who pitched for the Sounds this year: Emilio Pagan (’18), Lou Trivino (’17-’18) and J.B. Wendelken (’18). Catcher Josh Phegley (’16-’18), who earned his way back to the A’s roster this year after a stint with the Sounds, will back up Lucroy tonight, and Mark Canha (’17-’18) is in the outfield and another of the many A’s who played for the Sounds this year. There are also four A’s players who played for the Sounds at some point in the past few years on a major league rehab assignment: infielder Jed Lowrie (1 game in ’16), shortstop Marcus Semien (3 games in ’17), reliever Ryan Buchter (4 games in ’18) and outfielder Matt Joyce (9 games in ’18). If you want to subscribe to blog posts via email updates, you can do so in the upper right section of the home page.